Just like then Mercedes and particularly Lewis Hamilton at the Hungaroring looked out of it. Just like then Sebastian Vettel and Ferrari looked poised to make a major gain in the championship. Just like then rain then arrived and tilted things decisively towards Hamilton, who against expectations made the sizeable points gain instead. Only this time the rain arrived in qualifying. A few sniggered behind their palms when Hamilton hinted at divine intervention after the elements came to his aid in Germany. But with them now doing that right on cue for two rounds now on the spin, it may as well have been have been a matter of someone consciously guiding events his way. 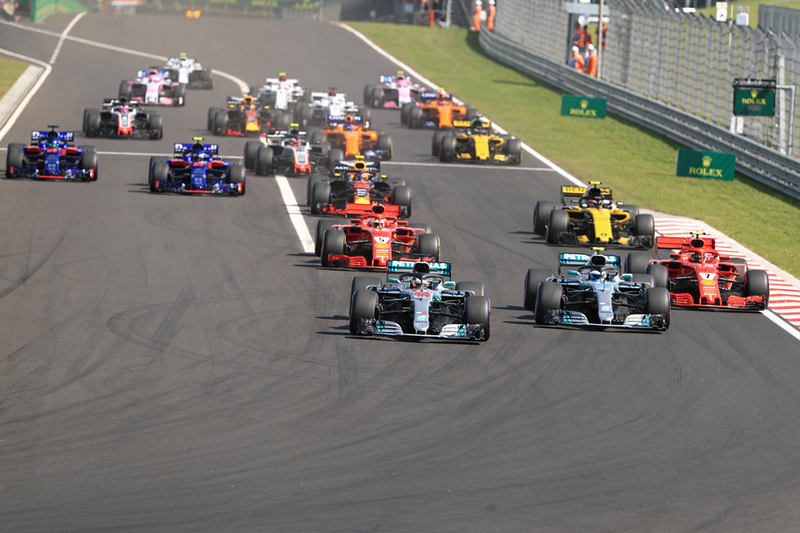 Qualifying order means a lot in F1 of course, and it has long meant a lot at the tight and sinewy Hungaroring. 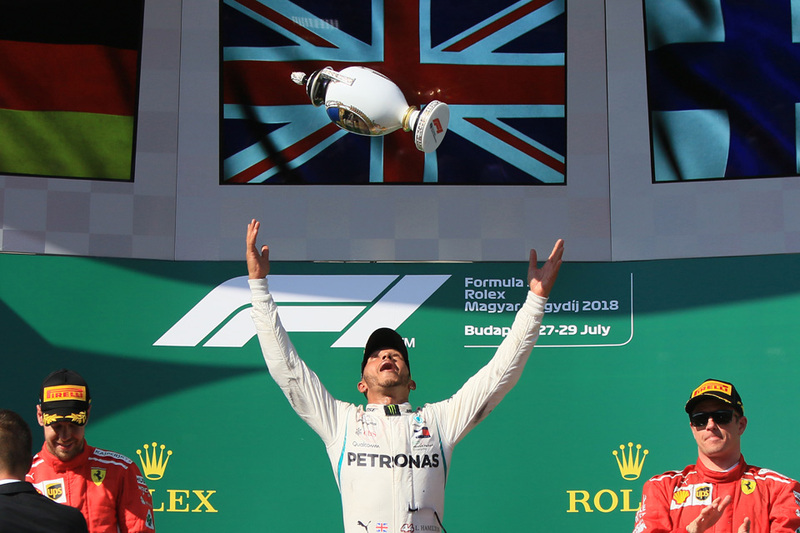 Sure enough leading from the race's off formed the basis of Hamilton's latest victory - but his performance on Sunday and particularly Saturday was highly impressive even so. In Friday practice it didn't look like the Mercs would get with the Red Bulls let alone the Ferraris; Hamilton also was self-admittedly off his team-mate Valtteri Bottas. Yet a thunderstorm in qualifying meant it was, as he also said himself, "game on". Just as at Hockenheim it allowed him to perform his party piece - bravery, creative use of lines for the maximum grip and the like. Not for nothing has he won the last nine rain-affected grands prix. Pole was his and it got even better for him behind. The friendly presence Bottas was next up and only then did we have the Ferraris on the second row - Kimi Raikkonen ahead of Vettel. 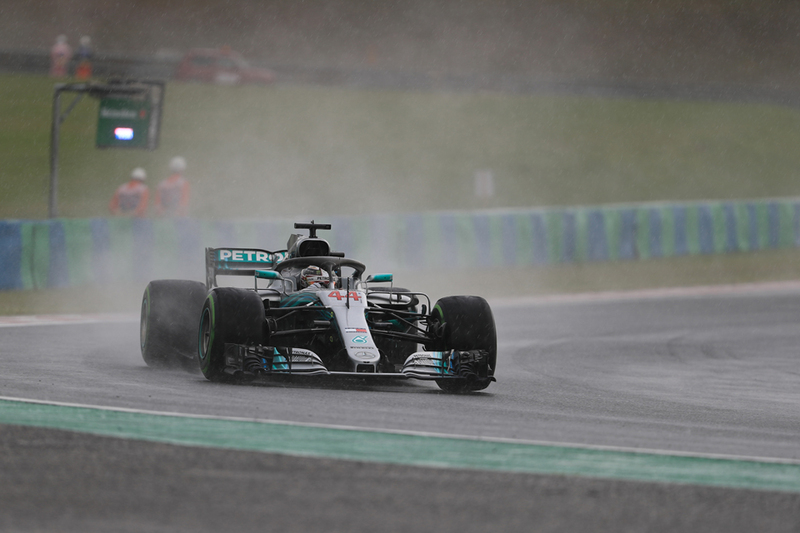 A few thought the Mercedes might be particularly potent in the wet, yet Raikkonen reckoned he could have had pole without traffic. 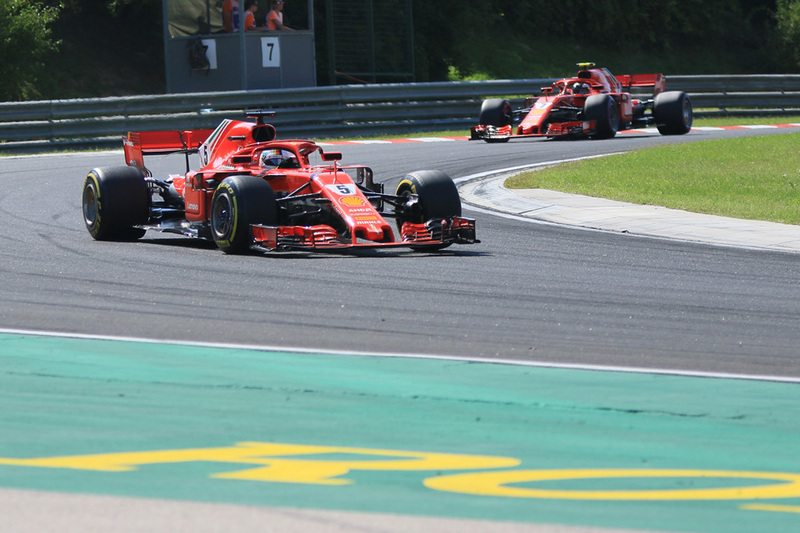 Still Ferrari's day was much better than Red Bull's, whose car was unfathomably off it in the wet and thus were as good as out of the picture in advance - Max Verstappen started seventh and Daniel Ricciardo 12th. The weekend had changed, changed utterly. And the significance wasn't lost on Hamilton, him noting Mercedes was now in position to - in modern F1 parlance - 'control' the race. So it proved. To begin with the Mercs on Sunday played the perfect team game. 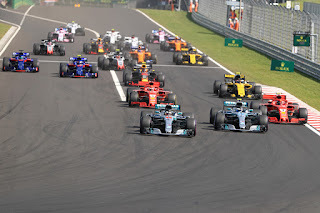 Hamilton scampered off into a clear lead in the early laps while Bottas hung back - helpfully bottling up the Ferraris in so doing, performing what Merc boss Toto Wolff called later the "wingman" role (a word which caused briefly a post-race kerfuffle). Ferrari did threaten to make it interesting though, aiming for something like a three card strategic trick. First Raikkonen pitted early forcing Bottas to follow him in a lap later to guard against the 'undercut' (more F1 parlance). This left Vettel with a clear track to Hamilton. Moreover the German had started on harder tyres and was able to run longer before pitting with the eventual aim of chasing down Hamilton late on with fresher and softer tyres. For a good while exactly this looked a go-er. But it unravelled. Vettel had established a 'delta' (F1 parlance again - that's enough time to pit and still be ahead) to Bottas, but then lost time in traffic particularly behind Carlos Sainz. Bottas - his team advising him of the emerging opportunity - put a spurt on with two consecutive fastest laps. Then Vettel had a slow stop, losing two seconds to the usual pit time. All together it meant after his halt he was tucked up behind Bottas all over again. The day, barring disasters, was now Hamilton's. Vettel though wasn't sure if it made a difference anyway - returning to the previous point about passing here. "We came out behind, that didn't help," he noted. "Without that it would have been a much more relaxed last part of the race, probably hunting down Lewis. "But with the gap that he had, I think it would have been difficult to catch - and then it's a completely different story, especially around here, to overtake. "I think we could have done the catching bit, but not really the overtaking." Vettel at least got second place back, getting by Bottas with six laps left when the Finn's long in the tooth tyres cried enough. Bottas personally rather degenerated too, first clumsily damaging his front wing on Vettel's Ferrari after being passed (although some thought Vettel could have showed prudence by giving more space), then - with a damaged front wing and tyres that we've mentioned - even more clumsily understeering into Ricciardo as he passed for fourth a few tours later. Bottas also got a post race penalty for it though it didn't effect his fifth place. Ferrari made do with a 2-3. Otherwise Merc could hardly complain about its day, which it would have snapped your hand and most of your arm and shoulder off for on Friday if offered then. Indeed it was only six laps short of the ultimate weekend's save of a 1-2 in which by rights it was nowhere. "We came here knowing that the Ferraris would be real quick this weekend but to come out with these points we'll definitely take as a bonus for us," Hamilton concluded aptly. Hamilton also spoke of crucial set-up changes throughout the weekend. "From Friday to Saturday I made a big car change," he added. "I made a big change in FP1, because I was uncomfortable with the balance. It's difficult to make changes in FP1 because you have to wait for the track to come to you rather than chase the set-up. "By the time I got to the end of FP2 I realised it wasn't the right direction so I had to pull back and go another way. We had a bit of running in FP3 but the car still wasn't perfect. And then it rained. I didn’t make any changes but I knew that Valtteri had had good FP2 running and we weren't too far off in the direction that we ended." An unlikely figure got best of the rest in sixth - Pierre Gasly in the Toro Rosso. 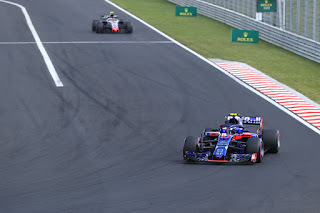 The car went well in the wet qualifying - Brendon Hartley started eighth to Gasly's sixth - and Gasly made good on it in the race too, moving smoothly clear of Kevin Magnussen's Haas next up. One wonders if Toro Rosso always understands its performance variations - see its incongruous fourth place in Bahrain - but it's entitled to enjoy its moment. 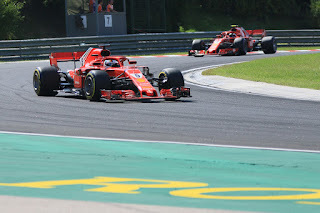 Birthday boy Fernando Alonso was next home in eighth after putting a Vettel-style long strategy to good use, and he likely would have been followed closely by McLaren team-mate Stoffel Vandoorne but he retired with a gearbox problem. Sainz and Romain Grosjean completed the scorers. Verstappen meanwhile dropped out early with an engine problem, turning the air blue as he did so. Hamilton now has a clear lead in the table - nearly a full win to Vettel - and five wins from 12. All too in a car that it's hard to argue has been the class of the 2018 field. Yet things are fascinatingly poised for the year's remainder given this very point. Then again, Hamilton and Mercedes tend to get stronger as seasons go on and the suspicion therefore lingers that Ferrari will live to regret its profligacy. After the summer break the Scuderia needs to start turning its potency into points. And for the rain to stay away. If we look back at the previous 13 seasons, then Lewis won't be champion.